Hollybeary Creations : NND March Sneaks Day 3!! NND March Sneaks Day 3!! Hey everyone... It's Day three of the Newton's Nook Designs March Sneaks and today is Newton's Day!! We are introducing the newest Newton set Newton's Birthday Balloons and coordinating dies. For my project, I paired this set up with Frames and Flags Die set and some Distress Inks. I created a White A2 size card base and I added the Scalloped frame from the Frames and Flags die set. I added some Squeezed Lemonade Distress Oxide Ink to the frame before I adhered it. Then I die cut the rectangle from the same die set and added some Tumbled Glass Distress Ink to create a sky. I stamped the sentiment along the top and adhered it to the scallop. I stamped Newton and the clouds onto some Copic X-Press It blending cardstock and colored them in with Copics and used the coordinating dies to cut them out. I adhered them to the panel with some foam tape. So cute!!! Would you like to win the “Newton's Birthday Balloons” Stamp Set? Comment on the NND blog and Design Team blogs (see list below)! The winner will be chosen at random from the collective reveal posts. Make sure to check out each of their blogs and comment for your chance to win. You will not know which blog has been chosen so the more you comment on the better your chances are of winning! You have until Thursday March 15th at 9pm EST to comment -- winners will be announced on the blog post on Friday, March 16th. Love this Newton ... ballooning! Awww!!! What a lovely card!!! Too cute!!! Its so very adorable card! 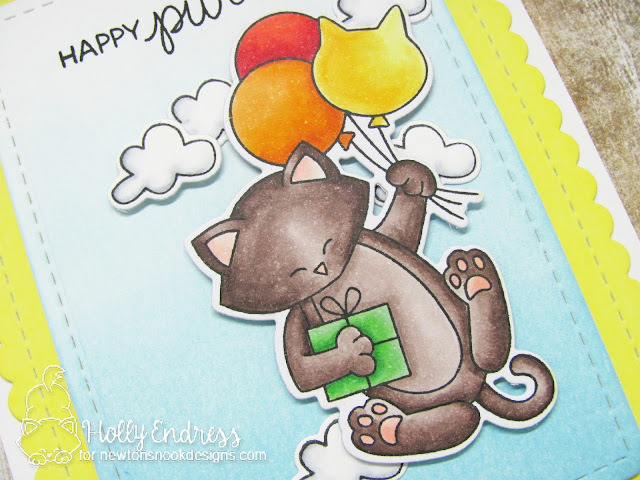 This kitty stamp is purrrfect! I love all of these new ideas! 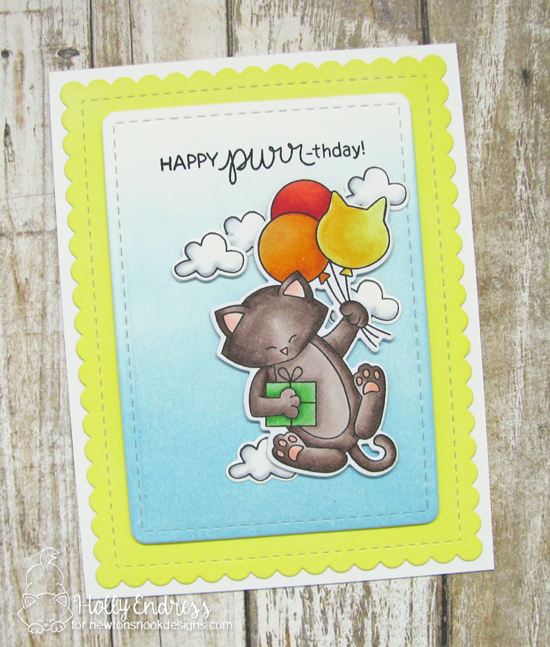 LOVE your cute card and that kitty ear balloon. Just so cute and fun!! What nice color choices you made. The bright backing makes the other colors stand out and vice versa. Love how you colored Newton in with your Copic's. So cute! This is so fresh and bright! It makes me ready for a bright sunshiny spring day! Thanks for the inspiration! Adorable new set with Newton! Love your adorable card! Love the bright frame around this cute scene. Your card is beautiful ! I love the bright border making the whole card pop-up. Newton is colored so nicely. Adorable. I like your coloring and the framing. Oh !! These balloons are so cute ! Love how you colored the cat! :) Looks great! What a great card. I like how you worked a rainbow in with all the acoutrements and the sky. This really is such a great stamp set that would give anyone a smile. so pretty card, very sweet! Fabulous card! I love the background colours! Lovely card!! can't go wrong with rainbow colors and balloons!